life in former times. We also publish regular updates about the group’s activities and where possible, we announce details of forthcoming events, publications and exhibitions. These dates, along with more details, can be found in our Diary section. 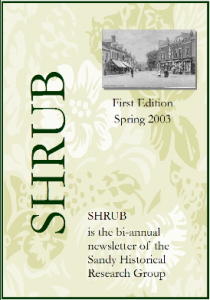 We also complement the Newsletter with items of immediate interest being posted in our SHRG News page. All contributions are welcome, large or small and everything we receive gets published (sometimes we get more that enough for one edition and then any excess material is carried forward to the next edition. Copy date deadlines are usually mid March and mid September, so get scribbling with your item for publication! Please note however, that we are only able to receive items for publication, which are in a email (plain text in the body of your email is fine), Word Document (or Open Office file, saved as a ‘.doc’ or ‘.rtf” file), or sent to us on a CD ROM. Items sent to us in hard copy only cannot now be accepted, as it will involve substantial re-typing and we do not have the resources to do this. We apologise for any inconveniences that may be caused.